Australian Staff Nurses in the grounds of No 1 Australian Auxiliary Hospital, Harefield, England. During the First World War Australian nurses served in 192 locations overseas, in Egypt, Lemnos, England, France, Belgium, Germany, Italy, Greece, Turkey, Salonika, Palestine, Mesopotamia and India, as well as on 39 ships. It is difficult to determine the exact number of Australian nurses who served since there is no complete official nominal roll of nurses for World War One. According to the Australian War Memorial 2,139 nurses served with the Australian Army Nursing Service, and 130 with the Queen Alexandra Imperial Military Nursing Service. A further 423 nurses served in hospitals in Australia. 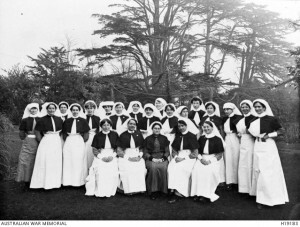 The National Archives of Australia cites 2,304 confirmed nurses, and perhaps as many as 2,497. The Australian Army Medical Corps (AAMC) established the Australian Army Nursing Service Reserve (AANSR) on 1 July 1902. It was organised from ‘those trained nurses … qualified and willing to serve as such with stationary Field Hospitals and Base Hospitals when required upon a National Emergency.” Nurses were expected to be single or widowed. When war was declared in August 1914 the Commonwealth called up the nursing Reserve and by October 1914 over 300 nurses had volunteered for the service. Nurses’ motives in volunteering for active service were varied. Some – like soldiers – craved adventure; many felt a patriotism for nation and empire, others sought independence, or to advance their career. Financial gain, however, was not an incentive, since military nurses’ pay was generally less than civilian rates of pay. In November 1948 the Australian Army Nursing Service Reserve was renamed the Royal Australian Army Nursing Service (RANS), and in July 1949 became part of the regular Army. New Zealand born military doctor Robert Campbell Begg described nursing during WWI as “the most important job of all”, claiming that on the battlefield hot drinks and warm blankets administered by nurses saved more lives than doctors’ drugs and operative skill. Mortality rates during the war would have been much higher without competent military nursing. Nurses worked relentlessly to reduce the shock suffered by casualties, to prevent dehydration and excessive blood loss, to curtail the onset of infection or pneumonia, all of which could prove fatal. Skilled nursing also helped to alleviate soldier’s depression while increasing their will to live. Nurses often worked under deplorable conditions. The No 3 Australian General Hospital was established in August 1915 at West Mudros on the island of Lemnos, Greece, in preparation for the evacuation of Gallipoli. Medical staff were forced to sleep outdoors on their first night there, and their equipment did not arrive for a further three weeks. Nurses worked in tents in primitive conditions, sterilising equipment and preparing food by spirit lamp, with scant water and other supplies. The battle of Messines on 7 June 1917 was the first large-scale action involving Australian troops in Belgium. Nurses at two Australian casualty clearing stations admitted 2,800 wounded men in 48 hours, clearing over 2,500 as well as assisting in over 1,000 operations. They managed to perform their duties whilst being bombed and showered by flying glass. At the conclusion of the war many nurses struggled to readjust to civilian life. Some could no longer work as nurses; others were unable to work at all. Women were not recognised as military veterans by the government, thus they were denied the much-needed healthcare and financial benefits available to returning soldiers. Australia’s Army nurses received national recognition in 1999 with the dedication of the Australian Service Nurses’ National Memorial in Canberra. Located in Anzac Parade, the cast glass memorial was unveiled on 2 October 1999 by the Governor-General, Sir William Deane. The memorial is dedicated to Australian Army Nurses past and present, who have cared for the sick and wounded since the South African War. Designed by sculptor Robin Moorhouse, the memorial is made of etched glass, with text and images cast into the inner walls that portray the history and contribution of Australian Service Nursing. In the words of the designer, the memorial is “a celebration of nurses’ lives, their courage and compassion”. * De Vries, Susanna 2013, Australian heroines of World War One : Gallipoli, Lemnos and the Western Front, Pirgos Press, Chapel Hill, QLD. * Goodman, Rupert Douglas 1988, Our war nurses: the history of the Royal Australian Army Nursing Corps, 1902-1988, Boolarong Publications, Brisbane, QLD. * Harris, Kirsty 2011, More than bombs and bandages : Australian Army nurses at work in World War I, Big Sky Publishing, Newport, NSW. I got the idea of giving a rough-riding display in public. We won five out of seven events open to all troops in Egypt at a show the other day. In the wrestling on horseback, one of my Queenslanders, a big half-caste named Ned Kelly, pulled the English Tommies off their horses like picking apples off a tree. You say what does this do towards winning the war? Well, it shows that we are up in our work and are doing it and it is not too easy. At the present moment I have two men with broken legs, one with a fractured shoulder blade, two with badly crushed ankles, and about seven others more or less disabled. I have never had to tell a man twice to get on a horse, no matter how hostile the animal appeared; in fact, they dearly like to do a bit of ‘grandstand’ work even though they risk their necks by it. The scenes made in Orange were those of the final charge on Beersheba, the climax of the whole film. The first scenes filmed were at Cronulla/Kurnell, in 1938. When Sydney’s sesquicentenary celebrations were in progress, and the Light Horse parading, my father gained permission of the Army to use the Light Horseman for scenes on the sandhills at Kurnell, depicting their long desert marches on the way across the Sinai, and their approach to Beersheba. He used these scenes as a ‘shop window’ to gain finance for the making of the film. Finance and final scripting, as well as construction of studio sets, casting, etc. took about a year and a half, so the main part of the production was not begun until May, 1940. Chauvel did his research well, gaining advice from his uncle, the General. He knew that the final part of the charge on Beersheba took place over flattish, hard ground, as the men had left the sands of Sinai behind. For that reason, he chose a venue near Orange. Alf Reid (This is the late Alf Read of Spring Hill) told me that there had been Light Horse encampments at Orange in 1939, so I am assuming that the charge scenes were made in that year, while all the studio preparations were in hand. Although it was basically only one scene, it was the most memorable scene of the whole film, and integral to the story. And sent him home to stay. Mary Spicer was born in Lewis Ponds and wrote many poems about the settlement and its people. “Our Boys” tells the experience of the three Spicer brothers – Jim, Samuel and Will – during World War I.
Jim – James Caleb Spicer – was born in 1888. The eldest brother, he enlisted at Orange on 6 January 1916 and left for France in June 1916 aboard the vessel Kyarra. Fighting in the 18th Infantry Battalion, James suffered a gunshot wound to the right forearm on 3 May 1917. He was subsequently transferred to England, where he was hospitalised and spent almost a year recuperating. James returned to France in April 1918, but was hospitalised in England again in May the following year. In June 1919 he boarded the vessel Themistocles to return to Australia, but was on board for barely a week before he was admitted to the ship’s hospital suffering from tuberculosis. Jim passed away at Randwick on 9 October 1920 from pulmonary tuberculosis. He is buried in Byng Cemetery. Sam – Samuel Archibald Spicer, born in 1890, was two years younger than Jim. He enlisted at Liverpool on 20 July 1915 and left for France aboard the vessel Ulysses in February 1916. Samuel was a sapper with the Mining Corps 1 until he was hospitalised in England in June 1917, suffering from pleurisy. He boarded the Benalla in October that year to return to Australia. Samuel was declared medically unfit for service and discharged in March 1918. Will – William John Spicer – was the youngest brother, born in 1893. He enlisted at Victoria Barracks on 20 July 1915, but was subsequently discharged in November that year as unfit due to chronic sciatica and lumbago.